Strenua, LLC leverages the wheel of health model as part of its' professional coaching services. 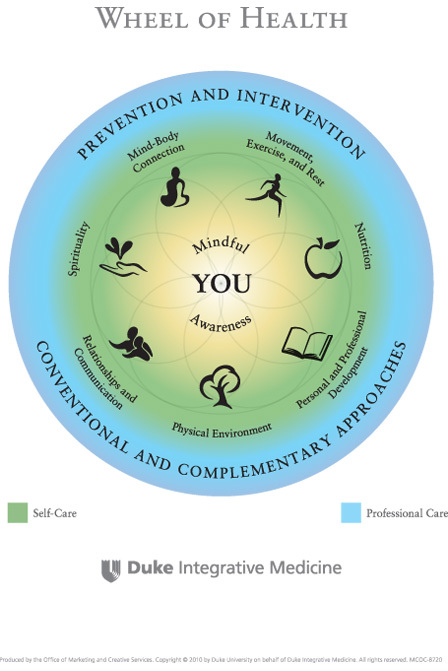 The Wheel of Health developed by Duke Integrative Medicine, IHC is not just about physical and mental well-being. It is also about the whole person, including values, goals, work, balance, fulfillment, and life purpose. Through exploration, a consistent commitment to action and moving forward, and accountability, Judy Liu partners with clients to explore and achieve professional goals, reach health and wellness balance to achieve optimal well-being.